WITH the notion of multiculturalism being kicked around like a political football, the diversity being showcased on reality TV shows such as MasterChef Australia is a testament to the fact that the infamous M-word is here to stay - and not just in the form of Chinese dumplings and Turkish kebabs. Woman's Day described her as the "contestant the whole country has fallen head over heels for". 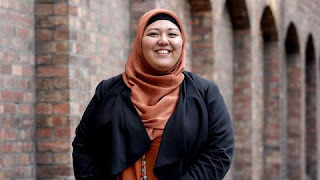 With national studies concluding that anti-Muslim sentiment in Australia sits at just under 50 per cent, real, positive coverage of Muslim women is to be welcomed. The results of a parliamentary inquiry, due in August, will investigate Australia's acceptance of people from culturally diverse backgrounds. It will conclude that one of the largest issues facing our nation is the acceptance of - you guessed it - Muslims. Given this climate, it's incredibly refreshing to see someone like Amina on TV not being defined by her religion or her hijab alone. Amina is a shining beacon of hope who has helped to create a positive image of Muslims just by being herself, instead of trying to represent an entire faith of 1.5 billion people. What's more impressive and heartening is how Australia has come to embrace Amina. Fans have inundated her Facebook page. Logie award-winner Chrissie Swan tweeted: "Whenever I look at Amina, or hear her speak, I get a rush of what can only be described as love. Warm, fuzzy, sunny love." Many, including Chrissie, admitted to being moved to tears when she was eliminated on Thursday night's episode. Amina's mixed family heritage is a beautiful example of the diversity of the Muslim community in Australia. It negates the assumption that all Muslims are Arabs. Amina's father is Egyptian and her mother South Korean. She is the only woman in her immediate family who has chosen to wear the hijab. It's a personal choice which some women choose to embrace and others don't. It is a fact that one of the best ways to tackle racism, discrimination and eliminate the fear of the "other" is to interact and engage in inter-faith, inter-cultural and inter-community dialogue. The so-called "fear" of Islam often arises because of the lack of interaction between those who hold this "fear" with your everyday, garden-variety Muslims. What's apparent is that there is a gradual and welcoming shift in attitudes. Dare I say that Muslim women are moving beyond being merely tolerated. Mariam Veiszadeh is a Muslim lawyer and advocate. Source.